BOXFORD – On August 16th, the Town of Boxford, cut the ceremonial ribbon on the newly built solar array on the former landfill on Spofford Road. Massachusetts’ Senator Minority Leader Bruce E. Tarr was invited as the Town’s honored guest in recognition of his critical leadership and advocacy in the Massachusetts legislature resulting in legislation to raise the net metering cap on municipal solar projects. 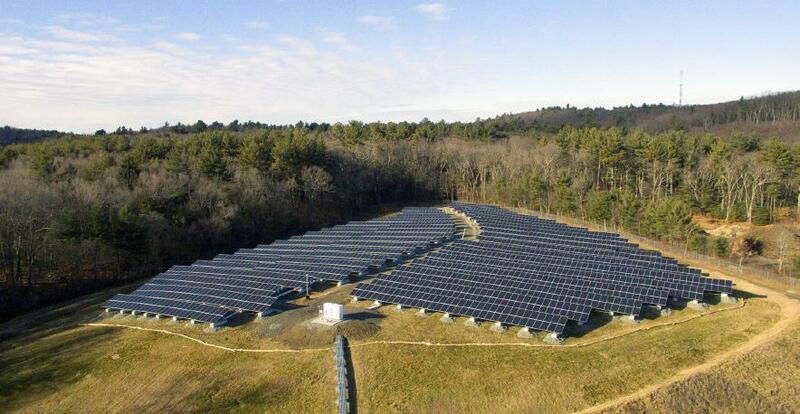 “The solar power facility was built on the Town’s capped former landfill which was leased to private equity firm Agilitas Capital of Durham, New Hampshire. Agilitas designed, built, owns, and will operate and maintain the project at no charge to the Town, in exchange for the Town purchasing the power at a highly reduced rate. The system is expected to generate more than 1,200,000 kWh of electricity per year. The solar farm will begin delivering electricity early in the fall once the connection to the utility is completed. About the Town of Boxford, MA www.town.boxford.ma.us Boxford is a rural, geographically large town with almost no commercial development and an estimated population is 8,600. The Town was incorporated in 1685. Heavily forested with many scenic hiking trails, Boxford is also home to numerous lakes, ponds, streams, wildlife, flora and fauna and has received the prestigious Tree City USA award for the 12th consecutive year.